The hi-Res900 3D uses the unique optical system from Daeyang to enlarge images generated by small LCDs. It can be connected directly to a variety of video formats such as, PC, DVD player, Video camera, VCR, Game consoles & TV. Producing a large crisp image equivalent to viewing a 45" screen at 2 meters. 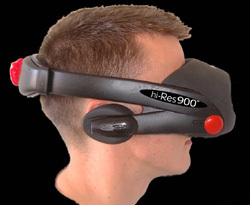 The newly developed 3D display system used in the hi-Res900™3D, integrates the various functions in one unit and is capable of showing separate images in to the left and right eye. The 3D system offers you so advanced and clear images by adoption of 0.49" LCoS reflective display panel.